The third wave of growth in Asia will be led by young Indians, a report by Deloitte LLP says. The first wave was led by Japan and the second by China. With China’s population ageing rapidly, the baton is set to be passed. Demography is the fundamental driver of all economies, says the report. “Its (India’s) rise as an economic superpower is about to be felt in earnest…India will account for more than half of the increase in Asia’s workforce in the coming decade. The consequences for businesses are vast: An Indian summer is coming, and it will last half a century,” added Deloitte. 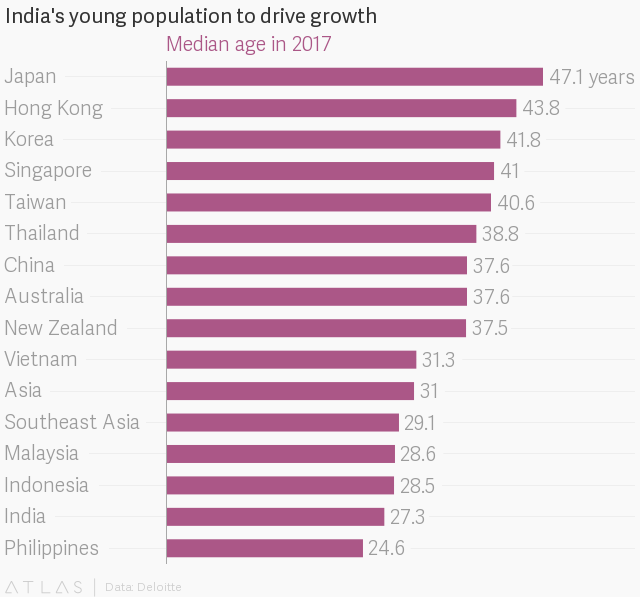 As of 2017, India’s population has a median age of only 27.3 years, as compared to China’s 37.6 years and Japan’s 47.1. India’s potential workforce is expected to jump from about 885 million people today to 1.08 billion in the next two decades, and will remain above the billion-people mark for another half-a-century, the report says. The future workforce will be better-trained and educated, strengthening India’s economic potential. Moreover, women’s share in the workpool—currently dismal—is also expected to improve, playing a key factor in boosting overall economic growth. India’s global ranking in terms of the female job-participation rate is the 16th lowest. Over the next decade, India’s working age population (between 15-64 years) will rise by 115 million people and account for over half of the 225 million expected across Asia. In this time, Japan’s working-age population will shrink by more than five million and China’s by 21 million people. However, India can’t take this growth for granted. If a right institutional set-up isn’t provided, this can turn into a bane, leading to unemployment and other social and economic disruptions.